Baden-Württemberg is among most prosperous states in Germany and the cradle of the German automobile industry. This is where the car was born in 1885 when Carl Benz filed a patent for his Motorwagen (or motorcar) which is widely regarded as the first automobile. The state of Baden-Württemberg is also the heartland of the German automotive industry. Porsche and Daimler (Mercedes and Maybach) are headquartered in the capital Stuttgart. The high performance Audi ‘RS’ models are designed, developed and produced in-house by Audi AG’s high performance subsidiary Quattro GmbH at its Neckarsulm factory. Mercedes’ high-performance subsidiary AMG is also located in this part of Germany. Many tuners are based in Baden-Württemberg as well, to name a few: Gemballa, Hamann, Novitec Rosso, Lorinser, PPI, RUF, SpeedArt and TechArt. Not only manufacturers of cars are important for Baden-Württemberg, also suppliers of automobile components like Bosch, Behr or Mahle are very influential. For example, Mahle employs 47,500 people and generated sales in excess of € 5.2 billion in 2010. Bosch even reported sales of € 47.5 billion last year. The leading manufacturer of automobile manual transmissions, Getrag is also a major employer in this region. The Hockenheim circuit is located here as well. In total there are 241 automotive companies which are responsible for one out of every five jobs in Baden-Württemberg. But now the German automotive heartland starts to worry about their own government. In the state assembly elections held on 27 March voters replaced the Christian Democrats and center-right Free Democrats coalition by a Greens-led alliance with the Social Democrats. The Greens won the elections due to their strong opposition against nuclear power and the controversial construction of the Stuttgart 21 project. But now the Greens are opposing the local car manufacturers as well. 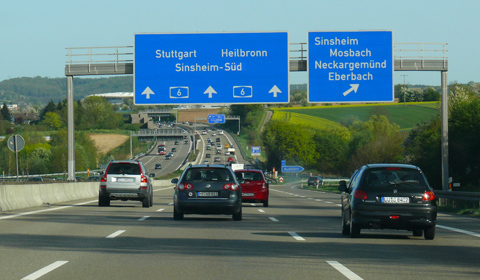 The Greens are planning to implement a speed cap of 120km/h (74.5mph) on stretches of the Autobahn that are currently unrestricted, which is almost 65 percent of all stretches in the region. It should be noticed that these stretches are also used by the many automotive companies for testing. According to Mercedes-Benz CEO Dieter Zetsche, speed limits aren’t good for business, noting that buyers from other countries view the Autobahn as part of the company’s formula for developing high-performing vehicles. “We’re well advised to maintain the Autobahn sections that don’t have a speed limit,” says Zetsche. Perhaps even more interesting was the fact Porsche refused to comment on this proposal. 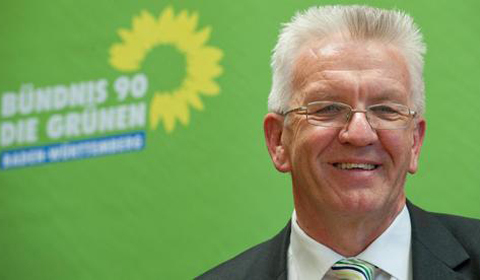 The first ever Green Minister-President of any German state, Winfried Kretschmann of Baden-Württemberg (pictured below) replied by saying the Autobahn contributes 30 percent of the area’s emissions and that “the transportation sector as to make a contribution of its own to reduce this gas that’s harmful to the environment.” He also added that making the car industry more ‘green’ is one of his main focus points. According to him, the car makers should focus on building environmentally friendly cars. The Greens favor fuel-efficient engines, the production of cars that use less gasoline, tolls and tax breaks for environmental friendly cars. Fewer cars are obviously better than more. We must get along with fewer cars in Germany. Just after electoral victory of the Greens in Baden-Wurtemberg an other German State, Saxony tried to attract investments as well by advertising in a local newspaper by suggesting a more business friendly environment. It should not be a surprise that the statement of Kretschmann annoyed Daimler. Erich Klemm, chairman of the Stuttgart based company criticizes Kretschmann. He points out that a total of 98,000 people are working for Daimler alone in Baden-Württemberg. The dominant metalworkers’ union in Germany, IG Metall was critical as well. Porsche responded by inviting the Green Minister-President for a dialogue about the future of car making in Baden-Württemberg. The Zuffenhausen based company is planning to invest in more research and development facilities, as well in more production capacity. It should be clear that Porsche has become critical, perhaps even skeptical to invest in their own region. It will become a major challenge for both the local politicians as for the automotive industry to reach an agreement. Perhaps Kretschmann should take a look at cars like the Porsche 918 Spyder or the Mercedes-Benz SLS AMG E-Cell so he would notice the future of car making is green. But if he wants to impose his political views on the car makers, than it would be interesting to see what the future will hold. One thing is for sure, the automotive industry in Baden-Württemberg will reconsider their future plans. The cradle of the German automobile industry already lost it heart, but will it loose the support of the car makers as well?